As you can see here, not a pretty sight and I would want to get rid of something like this as soon as possible too. The Captain told us to follow him a few steps into one of the fields, where he reached down and pulled up some leaves we had seen a million times, but never expected to be useful. He took about 4 or 5 leaves and had Matt chew them into a fine mush, but not too liquidy. He instructed Matt to spread this mush all over the infected area. A Few hours later...voila! Although this man is pasty, I can assure you that all the itching, redness and weird bumps were gone. 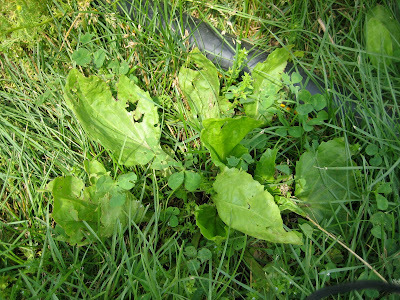 It was also interesting to find out that Plantain leaves were growing right in Matt's front yard. Who knew something that looked so unassuming could have such valuable use. 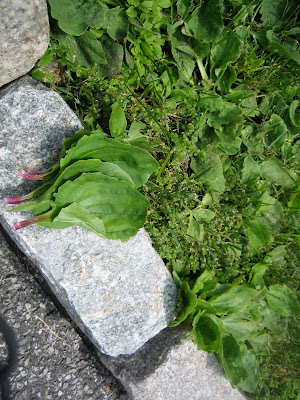 Plantain (Plantago lanceolata) has many health benefits and its uses date back to ancient civilizations. It can be applied externally by chewing and applying directly on insect stings and bites, rashes, blisters and other wounds. These magical leaves are also known to help remove splinters, thorns and reduce the effects of poison ivy. It can also be ingested, acting as an expectorant helping with bronchitis and clearing mucous buildup; simply steep some Plantain leaves in boiling water for 5-10 minutes and drink. We have all probably seen these leaves in parks and backyards and never thought twice about their importance. It's amazing to find out how much is right in front of our eyes and we don't even know it, but it's never to late to learn and pass it on. what kinda rash is it and do you know what the name is called and what caused it ?